This insect macro photograph by Masaki Ikeda is capturing a wasp spider in it’s natural environment. 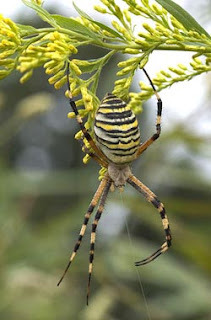 Wasp Spider (Argiope Bruennichi) is a fine yellow and black striped abdomen spider. The photographer is using Fuji Film FinePix S3 Pro with 90 mm lens focal length.